A 42-year-old British woman went to eye doctor because her left eyelid started to swell and ache. The doctors noticed her eyelid drooped a bit. But that wasn’t news to the woman — she’d had a heavy lid for a while and was used to it. After an MRI scan, doctors were able to see a lump had formed under the woman’s eyelid. 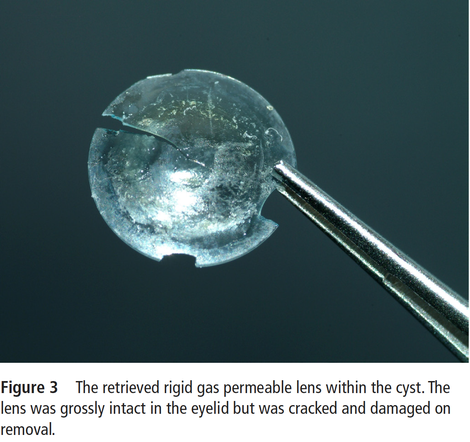 When surgeons operated, they ruptured the cyst and found a contact lens inside, according to a case study published last week in the BMJ Case Reports journal. The contact lens was fully intact, preserved inside the tissue. It was a rigid gas permeable lens, also known as a hard lens — a lens that is slightly more durable than most other types of contacts. But the woman hadn’t worn rigid gas permeable lenses in nearly three decades. Not since... the incident. The alarming discovery of the embedded lens reminded the woman’s mother of an incident 28 years earlier, according to the report. When the patient was 14 years old, she was playing badminton and a shuttlecock struck her in the left eye. She wore contacts at the time, but there was no contact in her eye when they inspected it. The family assumed it has fallen out. The woman never wore those type of contacts after that fateful day.